The MSI GE63VR is a gamer through and through, with all the racing stripes, chromatic keys and pixels you want. But, unlike most gaming laptops, it’s quiet, light and cool. The MSI GE63VR’s nickname is ‘Raider’, but it should be ‘Porsche’. The twin red racing stripes on the chassis tell you everything: it’s fun, comfortable and stylish – and, a whole lot of luxury. The Raider does live up its name in one sense though: it will take all your money. The gamer who wants a smooth, quiet ride as they blow up hell demons will love the GE63VR. The gamer who wants their hell demons blowing up at 120 frames per second (fps) forever and without fail may not. In the pennies-for-pixels (and battery) trade, the Raider is no Alienware 15 R3. That said, the GE63VR is still powerful – certainly more powerful than competing models, like the Origin EVO 15-S – but it’s costly, and that makes its flaws that much more noticeable. The memory-rich GE63VR we tested comes in at $2,249 (about £1,747, AU$2,836), though models with half the RAM (16GB) or a weaker GPU (GTX 1060) are available for between $1,799 and $1,999 in the US. The Kaby Lake Core i7 is standard across all models, as is the FHD display, and 1TB hard drive. The Alienware 15 R3 and Origin EVO15-S’s 16GB RAM models are priced at $2,050 (£2,737, AU$2,999) and $2,317 (£1,847, AU$2,834), respectively. The EVO15-S offers an extra terabyte of storage, but a weaker GTX 1060 graphics card; the R13 has similar specs to the Raider. The Raider, being a gaming laptop, is unsurprisingly heavy,. Hold off on the squats, though – the GE63VR’s 4.85 pounds are much easier on the knees than the Alienware R13’s 7 pounds. Like the EVO15-S and Razer Blade, the Raider hits the gym. Its relatively slim profile is half of what makes this laptop interesting. The other half is the cooling system. The GE63VR employs two fans, seven pipes, and four ventilation points to keep its temperature from ever going full Mojave Desert. And, it works. Neither web browsing nor long term gaming seems to tax it. Sure, it gets warm, but not so warm where you’d have to start wondering about the flash point of your jeans (or Ikea table). Despite its double fan cooling setup, the GE63VR isn’t an ear killer. 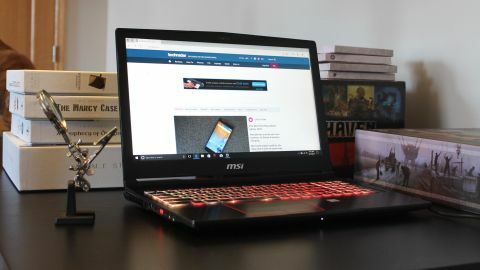 Sounds like a jet taking off is the popular refrain when it comes to describing a gaming laptop under load, but you won’t find it in this review. The Raider is so quiet, you can actually hear the in-game audio. And, it would be a shame if you couldn’t, as the Raider’s speakers are actually pretty impressive: the bass is strong, and the high ends are clear. Headphones are not required with this gaming laptop. The GE63VR’s keyboard is fully per-key programmable, both for color and function, through a downloadable utility, SteelSeries Engine 3. Multiple layouts can be saved and cycled through via a button on the right side of the body, or a phone app. The keys themselves have fairly deep travel, 1.9mm, but suffer from a slight mushiness that is noticeable during long sessions of typing. Fortunately, they are well-spaced, even though a numpad takes up a large amount of the body’s real estate. The left-hand Control and Shift keys are a little larger than their right-hand compatriots (smart), and a small LED lights up when Caps Lock is engaged (also smart). One quirk: the brightness and volume buttons are located in the arrow keys – a tad unintuitive, but certainly not a deal breaker. The Raider’s touchpad lacks ‘click’ feedback, but is otherwise responsive. Distinct left and right mouse buttons ensure you won’t miss whatever you’re trying to press. The whole thing is justified left on the body. And, that’s all you need to know, because you’re gaming laptop needs a gaming mouse, period, FIN. The Raider’s resolution isn’t impressive by today’s UHD standards, but the its 1080p FHD display is still plenty for a 15-inch screen. Besides, the real MVP is its refresh rate. At 120Hz, the GE63VR’s display is silky smooth – perfect for twitch gameplay. The laptop’s matte screen easily handles glare: nothing spoils its deep color contrast. Games run, and look, beautiful on the GE63VR.